Sybil Runs Things: That's Done, What Now?! Official race photo taken by Glenn Tachiyama. pretty close to the finish of my 50k! There is absolutely a bit of post-race depression that can happen after finishing a goal race. For me, focusing on training for the 50k consumed a HUGE amount of my thoughts, energy and time for 16 weeks. Add that to the race itself being absolutely a highlight of my life! Now it's a little like, what do I do with myself?! I spent the week after the race doing basically nothing. It's break time, there are no workouts on my calendar and I am doing a bit of stretching and yoga and that's it. Fortunately my body feels 100% fine. All of the little aches and pains I had leading up to the race were gone by race morning and never showed up again! So what's next? While I feel like I want to pull out my credit card and start registering for every 50k in the area, that's just not realistic. I can't let how amazing the race was overshadow how difficult and time-consuming the training was. Doing another Rainshadow Running race is definitely high on my list. The races are well-organized, incredibly fun, in beautiful locations, and (maybe most importantly to me), they attract a decent sized crowd. 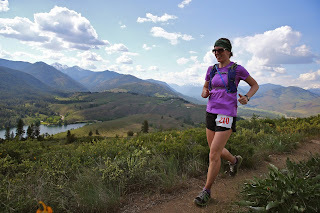 I appreciated having so many other runners out on the Sun Mountain 50k course, which was very different from my first two marathons that had many long stretches of loneliness. Rainshadow's last race of the year is the Deception Pass 50k in December, which of course looks amazing. A December 50k should give me enough time to step up my training again in the fall. There is also the Point Defiance 30k (or 50k) in October. I ran this race last year on my birthday and just loved it. This race isn't particularly difficult, elevation-wise. It does have the disadvantage of most of the runners doing just one loop of the course, which is a 15k. It got a little lonely for the 30k, and I imagine even more so for the 50k. But it is a beautiful course and, if the weather is anything like it was last year, will be a perfect day for running. I doubt I would be ready for another 50k by then, but the 30k would be completely doable. Hopefully I can jump in to something shorter over the summer. There are the Cougar Mountain races in July and August, which are a lot of fun. The summer will definitely be spent improving my strength and flexibility, doing more yoga, and overall focusing on whatever I can do to make a strong, rock-solid running body. And, of course, there are longer-term goals cemented in my mind. 2016 will definitely hold a 50 miler. Maybe at Sun Mountain? Not sure, will have to research more, but it WILL happen!